What are the reception hours of St Georges Motor Inn Thornbury (Australia) ? There is 24 hour check in available 7 days a week..
What is check-in and check-out times for St Georges Motor Inn Thornbury (Australia) ? Check In Time is 1400hrs, Check Out Time is 1000hrs. What is the phone number for St Georges Motor Inn Thornbury (Australia) ? What city St Georges Motor Inn Thornbury (Australia) is in ? 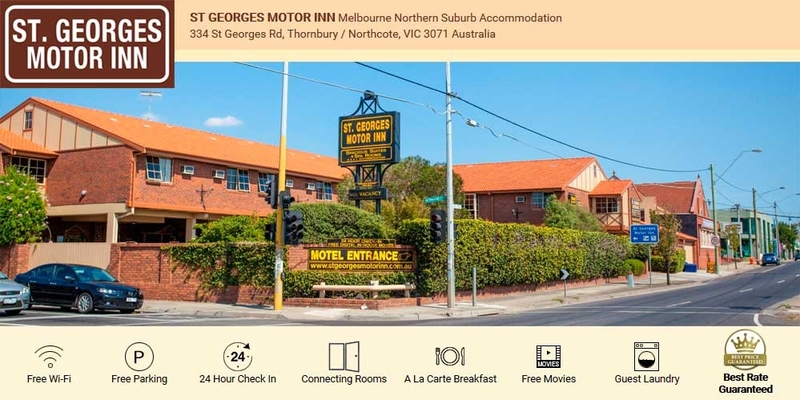 What is mailing address for St Georges Motor Inn Thornbury (Australia) ? Does St Georges Motor Inn Thornbury (Australia) have Wifi ? YES, WIFI is available at St Georges Motor Inn Thornbury (Australia). What credit cards are accepted by St Georges Motor Inn Thornbury (Australia) ?